Many years ago I was at a conference for work, and at the conference they talked about giving it our best regardless what we are doing in life. During this time they did an exercise and handed out the poem “The Man in the Mirror” and a little mirror and asked us to take a good look at ourselves. This exercise was a life changing experience. 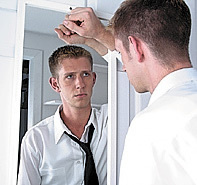 The person I saw in the mirror was not the person I wanted to be, and I knew I needed to make some changes. Over the years I have made major strides as I continually work on who I want to become. I am always reminding myself, life is about consistently striving to improve oneself by overcoming our weakness. In the end nobody cares how much we made, what we owned or where we lived. We will be remembered for the person we became.